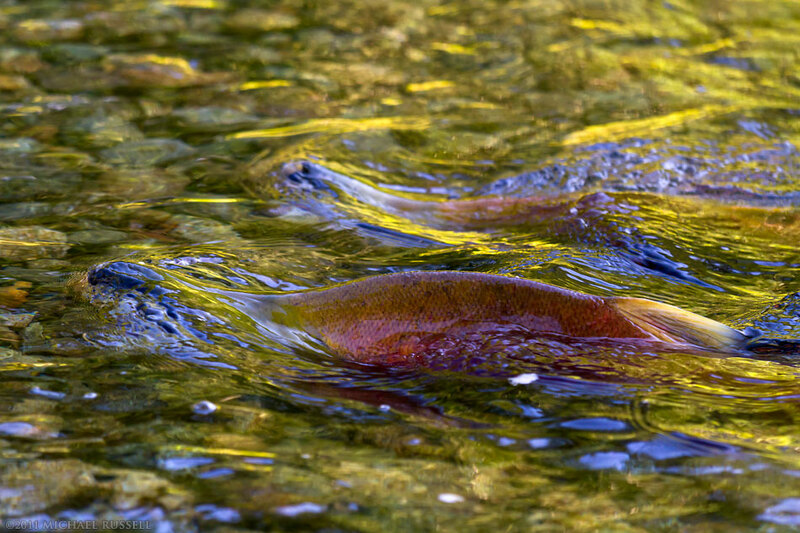 Spawning Sockeye Salmon (Oncorhynchus nerka) swimming upstream at Weaver Creek Spawning Channel. Last year I attempted to photograph spawning salmon in Weaver Creek in very late October. Most of the run had already finished, so there were a few salmon around but not many. This year I managed to get the timing a bit better, the run was late, and while I was there in late October again, there were plenty of salmon to photograph. This photograph is of two male Sockeye Salmon (Oncorhynchus nerka) “treading water” on their way upstream in Weaver Creek. One of the things I quickly realized when photographing salmon like this is that its just not that easy to make a good photo. Last year I tried photographing salmon in this location and was somewhat disappointed with the results. It was immediately obvious to me when processing those images that my expectations of what would be possible were way too high. The water distorts so much of the salmon shapes that some of my original ideas were not possible. This year returning I had thought about it a bit more and came up with this composition that I had planned. Salmon in the water like this are relatively easy to come by so I was left looking for a nice color reflection to give the scene something interesting. I think it works nicely.